Make Your Laundry Room More Functional and Laundry More Enjoyable! Whether you have a small laundry space or a tiny laundry room, the area can be both beautiful and functional. To most of us, doing the laundry is not a chore that we look forward to. We are convinced though that doing the laundry in a beautiful, fully functional space sure makes the job more enjoyable! A friend of mine has a two-story home and the laundry room is downstairs with the garage, two other bedrooms and a full bath. Because hiking up and down the stairs with baskets of laundry is not her idea of a good time, she just spends the entire time doing laundry downstairs and has outfitted the laundry room with everything to make a drudgery job super easy. So let’s figure out a way to do the same for you! Look at all four walls and the ceiling as your source for storage. By turning your attention to all of those laundry room surfaces, you’ll find a veritable gold mine of storage possibilities. Lining walls with horizontal shelving means you can line up rows of baskets and turn that barren space into an organizer’s fantasy. You can have a beautiful woven basket for everyone in your family. Now that you’ve washed and dried a houseful of clothes, each member of the family can pick up their own basket of folded clothes. You can use the rest of the space for a variety of storage containers like jars, boxes and even some vintage laundry items such as beautifully designed boxes of soap or apothecary jars. Don’t Forget About Your Doors The back of your laundry room door is often overlooked, but not anymore! A friend of mine hung a shoe and accessory organizer made up of 24 oversized pockets on the back of her laundry room door. She keeps everything from clothes pins to single socks to spot remover in it. It’s easily accessible, out of the way, tucked behind the door and saves valuable cabinet and cupboard space for other things. Every laundry room needs a space to fold clothes. Make sure you have finished walls, and if you don’t, give us a call! With little effort, you can add a wall-mounted collapsible, folding table top. If space is a premium this is the perfect solution and when not in use it folds neatly down against the wall. But if you have the space then be bold and use furniture like an old bookshelf or a corner unit. Picking up something from a thrift store is a great money saving idea. You can find items that were not designed or intended for use in your laundry room but will turn out to fit perfectly, provide storage and a surface for folding and interest. Remember laundry rooms can be beautifully useful. Retractable Clothes Line If you don’t have the space for a hanging rod, then a retractable clothes line might be the perfect solution. If you have delicates or other items of clothing that you want line-dried, then try a retractable line. You just pull it out to use and retract it when you’re done. It’s space-saving, affordable and easy to mount. Easy, affordable and artful. 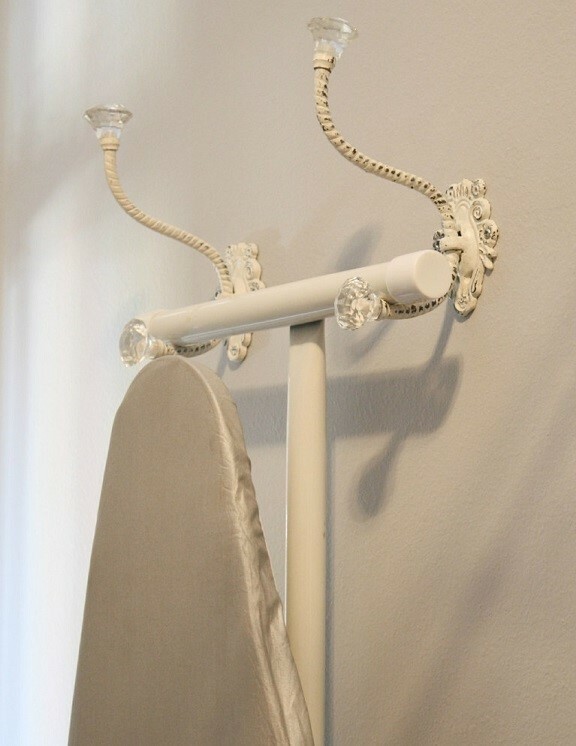 Place two hooks side by side and hang up your ironing board. It’s that quick and simple. Appearance If you have an older laundry room with faded, worn cabinets that have become duller over the years, consider having them professionally painted instead of replacing them altogether. Your local paint store will have the latest trends in interior paint colors and the skill to turn those dated cabinets into showpieces. Be sure to finish them off with trendy new hardware. And why stop at the cabinets. If your laundry room is the same color as the inside of your closet, think about painting it now. Painting is the one of the simplest home improvements you can make and one of the most affordable ways to update your space. Laundry can sometimes feel like the never-ending chore and since we spend hours each week in the laundry room why not make it as enjoyable as possible by renovating it with a few simple and affordable improvements to turn it into a room you will actually enjoy spending time in?